Carolyn Creswell, founder of multimillion dollar business Carman’s Muesli, started at 18 by offering her life-savings to buy out her employer. The subsequent growth of Carman’s is the stuff of entrepreneurial dreams. Carman’s is now the number one selling muesli brand on Australian supermarket shelves and exports to over 32 countries. Although successfully completing an Arts degree at Monash University, Creswell has had no formal business mentor or coach, nor has she done any business studies. She has learned on-the-job and believes that because she has done everything herself at one time or another for the business, she can empathise with her staff much more easily about their jobs and the hurdles they may be experiencing. 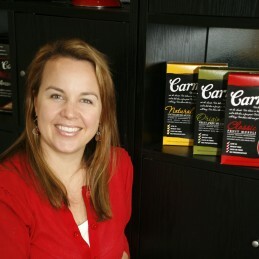 Carman’s has been named one of BRW’s Fastest 100 Growing Companies and Carolyn has recently won the 2012 Telstra Australian Business Woman of the Year Awards, the 2009 InStyle Women of Style Awards, the 2008 Veuve Clicquot Award which is presented in 17 countries annually to honour exceptional women in business, and the winner of the 2007 Ernst & Young’s ‘Young Entrepreneur of the Year’ Award. Carolyn is a graduate member of the Australian Institute of Company Directors. She is also an active board member for Stephanie Alexander’s Kitchen Garden Foundation. Carolyn is married with four young children and prides herself on the balance she maintains between her career and her growing family.